My daughters have been on at me for a while now to make these ingenius Holy Eggs (1) from Janie at The Hedge Combers – I think they can see the endless possibilities for funky shaped cut-outs. Perfect for campfire cooking or lazy weekend brunches at home. 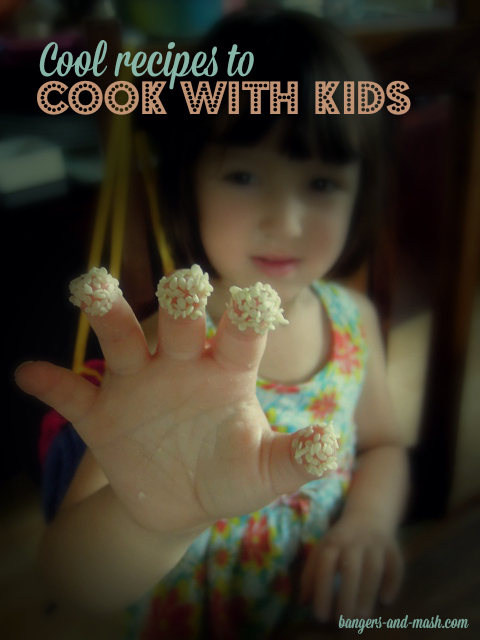 Linsy from Home Cook Food has shared a couple of quick and easy savoury snacks that should be child’s play in the kitchen. There’s her tasty Chilli Cheese Sandwich with Chinese Tomato Soup (2) and a One Minute Microwave Masala Omelette (3) – how quick is that?! Next up is my fellow Family Foodies host, Louisa from Eat Your Veg with her brilliant Bread Tarts (4). They’re a cross between quiche, eggy bread, omelette and a toasted sandwich. Pretty neat eh? And just perfect for little ones to make themselves for lunch or an after-school snack. Pasta is a favourite dish for my own children to cook themselves and this Penne with Meatballs (5) was their offering for the Family Foodies challenge. The recipe came from Chop Sizzle Wow, a great new cartoon-style cookbook from the publishers of The Silver Spoon. I wasn’t entirely sure whether to list this intriguing Chocolate Hummus (6) from Bintu at Recipes From A Pantry in the sweet or savoury section, but I’ve plumped for sweet! It’s a fabulous idea isn’t it, and one I’m definitely going to be trying out very soon with my girls. When it’s cold and wet outside, children the world over love baking up a batch of cookies or biscuits. The next time I need a rainy day activity, we’ll be making these delicious Oaty Ginger Chocolate Biscuits (7) from Choclette at Chocolate Log Blog. They look decidedly moreish, don’t you think? Doesn’t this Chocolate Cake (8) from Jacqueline at Tinned Tomatoes look simply magnificent? And I love the story behind it too. It’s the start of a new tradition, the ‘First Day at School Cake’ as she baked it with her gorgeous son Cooper to celebrate his first day at primary school. What a fantastic idea! Linsy from Home Cook Food is back with another offering, a sweet one this time: Indian Rice pudding with Puris (9). Personally, I’ve always had a bit of a problem with rice pudding, resulting from some disgusting school dinner experiences, but perhaps I should try again? And with nuts and spice, maybe this is the recipe to change my mind? These Chocolate Popcorn Triangles (10) from Janice at Farmersgirl Kitchen are a superbly simple sweet treat to rustle up with the kids. Janice recommends these for a Halloween party but I reckon they’d be a great bake-free bake all year round. These Halloween Cake Pop Spiders (12) from Kate at the Gluten Free Alchemist on the other hand are much, much cuter with their big bug eyes and liquorice legs. And I bet they’re delicious too, filled with chocolate cake and flavoured with honey and coconut cream. Perfect for little trick-or-treaters. We had a go at some cake pops too with these Halloween Ghost Cake Pops (13) from a Dr Oetker recipe. They went down an absolute storm at the school cake sale the other week. Last but not least, how about these Crispy Cake Bites (14) from Helen at Family-Friends-Food? Another no-bake cake, they’re filled with dried fruit, nuts, crisped rice, spice, chocolate and one of my favourite ingredients of the moment, caramelised biscuit spread. Helen reckons they’re pretty intense, so one is plenty. But I reckon I could definitely manage a second. Or maybe a third? It was a very tricky one this month as there are just so many recipes here I can easily see me cooking up with my kids. But the prize this month goes to Kate at the Gluten Free Alchemist for her spooky Halloween Cake Pop Spiders. Kate wins a Lakeland gingerbread house cutter set – a great baking project with Christmas just around the corner. Thanks to everyone who entered the Cooking With Kids challenge. 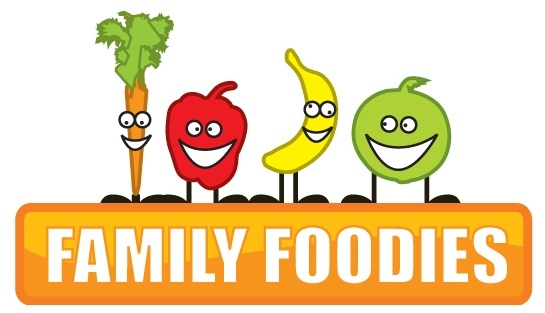 November’s Family Foodies challenge is now open over at Eat Your Veg, where the theme this month is Vegetarian. Can’t wait to see what you come up with! Congrats Kate your spiders are totally brilliant and super cute!! And I’m so pinning them for next Halloween. Great round up Vanesther, packed full of fab recipe ideas for the little ones. Fab recipes, lots of ideas for biggies as well as littlies!